As our economy evolves, private equity groups, hedge funds, and investment banks compete and cooperate in different ways. 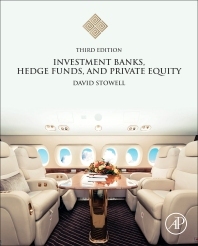 Their recent innovations are reported and analyzed by the 3rd edition of David Stowell’s landmark book, which adds three new cases, significantly revisions of most chapters, and updated figures, tables, and exhibits. It captures the actual work that associates and vice presidents do, providing readers with templates for real transactions. Finally, it provides significantly more content about the ways liquidity is supplied in secondary markets, including an overview of high frequency trading/electronic market making, quantitative trading strategies, and the evolution of cash equities from open outcry pits to fully electronic central limit order books. David P. Stowell is a professor of finance at Northwestern University’s Kellogg School of Management, where he teaches classes that focus on investment banking, hedge funds and private equity. He also teaches undergraduate courses on these topics at Northwestern University, University of Utah, and Utah State University. Prior to joining Northwestern in 2005, he was managing director at JP Morgan, working in Chicago with responsibility for part of the firm's mid-west investment backing business. In addition, he worked in investment banking at UBS as managing director and co-head of U.S. equity capital markets, and at Goldman Sachs, where he managed an equity derivatives business and worked in corporate finance in New York and Tokyo. He was also a managing director at O'Connor Partners, a hedge fund based in Chicago. He graduated from Utah State University with a BA in Economics and from Columbia University's Graduate School of Business with an MBA in Finance. In addition to his current teaching responsibilities, he manages Paradigm Partners, a boutique investment bank that provided M&A and capital raising services and general advice in investment banking, hedge fund, and private equity activities to selected clients.